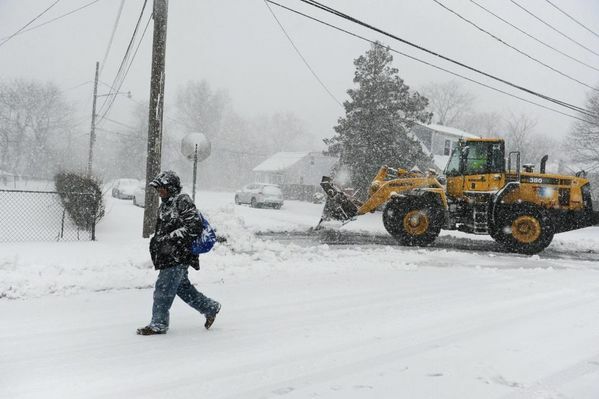 About 100 Town of Smithtown workers were clearing roads Thursday afternoon, Highway Commissioner Robert Murphy said. Highway department workers were deploying beet juice, a road clearing ingredient that can be used in place of or along with salt to keep melted ice from refreezing. A few other Long Island municipalities including Brookhaven and Sag Harbor have done the same. “When this came into the industry three years ago, we looked at each other and said, ‘What can beet juice do?’ ” Murphy said. But, he said, “We’re finding it’s successful.” Highway workers were reapplying the juice at two-hour intervals yesterday, he said. The snow storm Thursday meant an especially long commute for West Babylon resident Victoria Novo. “I spent most of my day trying to get to work and from work,” said Novo, who works at a finance and technology company in Manhattan. The 28-year-old left work early to beat a possible LIRR closure and was waiting in the Babylon train station Thursday afternoon for her father to drive her home. Park Bake Shop owner Lucy Shtanko, 49, said she was sending employees home and planned to close early after serving just 35 customers by midday. Normally, more than 300 would have stopped at the Kings Park mainstay for pastries and coffee. Blizzard or no, the bakery will reopen at 5 a.m. Friday morning, she said. How bad was the blizzard? Both the Orient Point and Port Jefferson ferry companies canceled numerous trips across the Long Island Sound. A message posted on the Cross Sound Ferry website said all ferry trips between Orient Point and New London, Connecticut, had been canceled, except for a 9 a.m. trip. A recorded message on the ferry company’s phone line said ferry rides were expected to resume on Friday. The website of the Bridgeport & Port Jefferson Steamboat Co. said the company was “closed until further notice” because of the blizzard. Spokesmen for both ferry companies could not be reached for comment. A man walks past a Town of Babylon plow on Schleigel Boulevard in North Amityville as a heavy snowstorm blankets Long Island on Thursday, Feb. 9, 2017. "We should be in good shape for the rush hour tomorrow," Governor Andrew Cuomo said during a press conference in Suffolk County Thursday. Suffolk County Executive Steve Bellone added that there has been about 100 motorist rescues since the storm began this morning, and with colder temperatures coming tonight, roads will get icy and dangerous to navigate. "We're in for a long night," he said of town and village snow removal crews. Large areas of Montauk and Southampton are reporting outages as of 1:45 pm Thursday. PSEG's outage map showed nearly the entire village of Montauk and areas beyond, including Montauk Harbor and Montauk Point, without power. Crews had been dispatched and the reason for the outage hadn't yet been determined. Areas of Southampton had also been hit by outages, including more than 1,300 customers impacted in Southampton Village. In a statement, PSEG vice president John O'Connell said, "The mix of wet snow and blizzard conditions impacting the service territory may increase the likelihood of downed wires and power outages, but we are prepared and working to restore any outages as quickly and safely as possible." PSEG spokesman Jeff Weir said the Montauk outage resulted from a "locked out distribution feeder," likely the result of a fallen power line. Crews were responding, he said. As of 11 a.m., Suffolk County police officers had helped 51 stranded motorists dislodge their vehicles stuck in the snow, said Timothy Sini, the department’s commissioner. “But that number is probably significantly up since then,” Sini said in a phone interview at about 12:45 p.m.
From 5 a.m. until about noon, Suffolk police received emergency calls for 56 accidents. At the time of the phone interview, Sini said, police officers were responding to 12 active accidents across Suffolk. Sini thanked those Suffolk residents who heeded the warnings and stayed off the roads. Because of the lower volume of cars on the roads Thursday, the call volume and number of accidents were not above average, he said. Each precinct in the department has deployed Humvees and other heavy trucks to find and help motorists. “We’re out in full force helping those who are stranded,” Sini said. Still, “things are under control,” Sini said. Long Beach City officials were monitoring the storm Thursday that left more than 7 inches of snow. Most of the snow had stopped falling, but was still blowing by early afternoon. The city had plows and trucks manned throughout the city at all times to focus on plowing certain neighborhoods and streets. The city used a sand and salt brine on streets Wednesday night. Long Beach officials had about 50 pieces of equipment, including 40 plows, four bobcats and a backhoe. The beach was unaffected, and no flooding was reported. Most streets and businesses were largely empty and no major collisions were reported. City workers were responding from City Hall and advising residents to stay home when possible because of high winds and poor visibility. Homeowners were asked shovel sidewalks. The city sent out a robocall, email blast and posted messages on social media. At a noon news conference in Midtown Manhattan, Gov. Andrew M. Cuomo urged Long Islanders to stay off the roads, and said while state roads such as the Long Island Expressway remained open, he planned on assessing road conditions further to determine if road closures were needed. Cuomo said state roads for the most part had been cleared of snow, but officials were encountering reports of motorists getting stuck on entry and exit ramps and side roads. He said the state has deployed tow trucks to help these stranded motorists, but he urged commuters to get off the roads early. Ronnie Hakim, head of the Metropolitan Transportation Authority said there were no plans to shut down the LIRR, and that officials added four trains departing from Penn Station starting at 1:49 p.m. to encourage commuters to head home early. “Service across our region has been proceeding without major interruptions or incidents,” Hakim said, describing the MTA’s network of buses and trains including the LIRR and Metro-North.